For other uses, see Wigwam (disambiguation). This article is about the dwelling sometimes called a wikiup. For the census-designated location, see Larkfield-Wikiup, California. For the unincorporated community, see Wikieup, Arizona. A wigwam, wickiup or wetu is a semi-permanent domed dwelling formerly used by certain Native American and First Nations tribes, and still used for ceremonial purposes. The term wickiup is generally used to label these kinds of dwellings in the Southwestern United States and Western United States, while wigwam is usually applied to these structures in the Northeastern United States and Canada. Wetu is the Wampanoag term for a wigwam dwelling. These terms can refer to many distinct types of Native American structures regardless of location or cultural group. The wigwam is not to be confused with the Native Plains teepee, which has a very different construction, structure, and use. The domed, round shelter was used by numerous Native American cultures. The curved surfaces make it an ideal shelter for all kinds of conditions. These structures are formed with a frame of arched poles, most often wooden, which are covered with some sort of roofing material. Details of construction vary with the culture and local availability of materials. Some of the roofing materials used include grass, brush, bark, rushes, mats, reeds, hides or cloth. Wigwams were most often seasonal structures although the term is applied to rounded and conical structures built by Native American groups that were more permanent. Wigwams usually take longer to put up than tipis and their frames are usually not portable like a tipi. A typical wigwam in the Northeast had a curved surface which can hold up against the worst weather. Young green tree saplings of just about any type of wood, ten to fifteen feet long, were cut down and bent. While the saplings were being bent, a circle was drawn on the ground. The diameter of the circle varied from ten to sixteen feet. The bent saplings were then placed over the drawn circle, using the tallest saplings in the middle and the shorter ones on the outside. The saplings formed arches all in one direction on the circle. The next set of saplings were used to wrap around the wigwam to give the shelter support. When the two sets of saplings were finally tied together, the sides and roof were placed on it. The sides of the wigwam were usually bark stripped from trees. The male of the family was responsible for the framing of the wigwam. Mary Rowlandson uses the term Wigwam in reference to the dwelling places of the Native Americans that she stayed with while in their captivity during King Philip's War in 1675. The term wigwam has remained in common English usage as a synonym for any "Indian house"; however this usage is incorrect as there are known differences between the wigwam and the tipi within the Native American community. 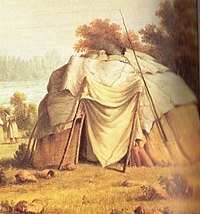 During the American revolution the term wigwam was used by British soldiers to describe a wide variety of makeshift structures. Wickiups were used by different indigenous peoples of the Great Basin, Southwest, and Pacific Coast. They were single room, dome-shaped dwellings, with a great deal of variation in size, shape, and materials. 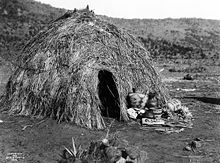 The Acjachemen, an indigenous people of California, built cone-shaped huts made of willow branches covered with brush or mats made of tule leaves. Known as Kiichas, the temporary shelters were utilized for sleeping or as refuge in cases of inclement weather. When a dwelling reached the end of its practical life it was simply burned, and a replacement erected in its place in about a day's time. Near identical constructions, called aqal, are used by today's nomadic Somali People as well as the Afar people on the Horn of Africa. Pieces of old clothing or plastic sheet, woven mats (traditionally made of grass), or whatever material is available will be used to cover the aqal's roof. Similar domed tents are also used by the Bushmen and Nama people and other indigenous peoples in Southern Africa. In Britain, similar structures known as bender tents are built quickly and cheaply by New Age travellers, using poles from the woods (often hazel) and plastic tarpaulins. Yaranga has similar shape, but have internal yoronga-room inside the dome. ^ For a complete description, see "We are now ... properly ... enwigwamed." British Soldiers and Brush Huts, 1776–1781, John U. Rees, 2003 (originally published in the Military Collector & Historian, volume 55, number 2 (Summer 2003), 89-96. ^ "wigwam". Dictionary.com Unabridged. Random House. Opler, Morris E. (1941). 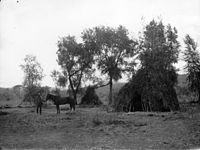 An Apache life-way: The economic, social, and religious institutions of the Chiricahua Indians. Chicago: The University of Chicago Press. (Reprinted in 1962, Chicago: University of Chicago Press; 1965, New York: Cooper Square Publishers; 1965, Chicago: University of Chicago Press; & 1994, Lincoln: University of Nebraska Press, ISBN 0-8032-8610-4). 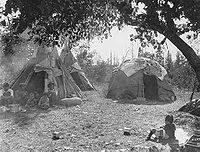 Wikimedia Commons has media related to Wigwam or Wickiup. Chisholm, Hugh, ed. (1911). "Wigwam" . Encyclopædia Britannica. 28 (11th ed.). Cambridge University Press. p. 629.